Simple, useful and economical for all grades of students. This Camel Bone Inlaid Painted Pencil Box would be just the thing for storing those luxurious pens used only for the really special occasions. With its ethnic style inlay pattern one would almost expect to find it encompasses a quill befitting a king. Fine Bone Pencil Box Available In Different Designs & Sizes. Designing and developing a unique collection of Camel Bone Painted and without painted Pencil Boxes. They are made from optimum quality of raw materials that are procured from trusted and reliable vendors of the market. Rana Overseas Manufacturer, Supplier and Exporter of Wooden Pencil Boxes and Wooden pen boxes, Traditional wooden pencil box with sliding lid. The perfect way for children to keep pencils, and small stationery items safe in their school bag or on their desk. The above product is a toll or pen or pencil keeping box.this is a hand woven from bambo.The height of the round box is 10 inch and the round about is 3 inch.This can be painted or customised according to the requirement of the customer. In order to cater to the numerous necessities of the patrons, we have been able to provide a wide range of Wooden Pencil Box. With an attractive hand-painted figurine on the top, your Figurine Fun Box with Stationery Kit can be used to keep your pens, pencils, erasers, scales and sharpeners inside. Accessories: Box opens only when the Arrow points to Chhota Bheem's Laddoos! 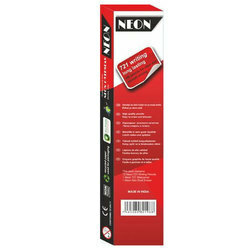 We are instrumental in exporting of long lasting Sticker Pencil Box / Plastic Pencil Box Royal, which are manufactured using graded plastic. Our vibrant light purple color boxes are spacious and curvy. These are liked by kids world-over for their features like stylish design and less space accommodation. 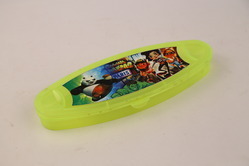 To make these attractive, we make use of attractive sticker on the top of the pencil boxes.